Do you want the luxury of taking vacations every year, and travelling to the most beautiful places in the world? Do you want to be in control of your own destiny and have both time and financial freedom time, so you can do the things you are really passionate about. Many people have heard about or even tried to make money with the law of attraction, and you can make more money, but if you have tried and failed, then it could be a case of deep down you don't believe you can or you have some limiting beliefs about money. You're no different to anybody else, therefore if you want to become wealthy, then you can if you start to get your powers working for you to bring the opportunites, idea's and circumstances that you need. If you want or need more money, but you can't get more money, then this can mean that you might have some inner beliefs that is stopping you. Most of the time, it is your negative thoughts and negative beliefs about money that prevent you from obtaining money, rich people attract money to them whilst the poorer people tend to repel money from them. This is often because their negative thoughts and beliefs block them from getting more money. Many of our limiting and negative subconscious beliefs that block off the pathway to more money are conditioned into us as early as our childhood days, then as we progress through life, often struggling to make ends meet, we reinforce these limiting beliefs. If your parents were poor and hard working or they struggled with money, then you will have probably picked up these beliefs and carried them through with you into your adult years. Then, because you probably worked with people who were like minded and who struggled as well then this would have furthered conditioned you to think money was hard to come by. Once these beliefs have been set in your subconscious mind then they will set the standards of the kind of life that you go on to live. The good news is, these beliefs are not facts and they are not set in stone and they can be changed and when you change your beliefs then you can change the destiny of your life. To open the door to more wealth you need to get rid of those mental blocks and beliefs that are preventing you from making more money and then you need to give your subconscious mind a new set of instructions and beliefs to follow. To achieve this, your mind needs to be programmed to think and act like a millionaire. According to multi-millionaire and Amerca's leading hypnotherapist Steve G Jones, it is impossible to become rich if you do not have the right mindset, beliefs and drive. Your first step should be to develop the right positive mental attitude because your attitude and mindset are everything, this may involve getting rid of some of your preconceived ideas and limiting beliefs you have as regards to money. If you ask any millionaire their opinion, what's the secret to becoming rich and wealthy? The answer they will all give you is simple. It's the millionaire mindset, this is the secret formula there is nothing else. If you want to be wealthy, you have to think, live, and breathe like a millionaire. Multimillionaire many times over Steve G Jones is regularly featured in magazines, like Forbes and People's magazines, he has written many articles on this subject, and taken part in many radio interviews. Steve went from poverty to great wealth by making some shifts in his mindset, and now he helps countless celebrities, Business Professionals and many leading sports starts improve their business and change their lives. Contrary to what many people believe, you do not have to be born successful or born into wealth, because anybody can become wealthy and successful if you're open to change and suggestion. But, if you want a better quality of life or you want to escape from poverty or struggle, then you have to break free from the mindset that is holding you stuck where you are. Steve claims, that you have to act and think like a millionaire before you can become one, and as he says, all millionaires know and apply this secret and formula whether it is through choice or they have accidentally stumbled across it. Steve also goes on to suggest that in most cases, wealth is not possible to obtain without the right thoughts and the millionaire mindset. Steve G Jones, who has achieved great success and accumulated a lot of wealth, says. This might sound controversial to some people, but remember, I’ve spent half a lifetime surrounded by people who have achieved great success (financial included), so I know what I’m talking about. Positive thinking is not enough to bring you wealth, because no matter what other self-help experts out there tell you, it is not enough. Positive thinking by itself, equals future disappointment, and although it is important to think positive, becoming a millionaire requires more. The first step to becoming a millionaire is to have the mindset of a millionaire, therefore you need the thought processes of a millionaire, backed up by the beliefs of a millionaire and the programming of a millionaire. The trouble is, unless you were brought up with a wealthy background, most people have been conditioned to believe that money is hard to come by and it takes hard work to make money or you have to have money to make money. However, these are just beliefs and not facts, and although these types of limiting beliefs will prevent you from becoming rich, they are just beliefs and all beliefs and conditioning can be changed. This does not mean that becoming rich does not involve effort and a lot of action, what Steve is saying is, you have not got to take the long hard path to success or to enjoy the wealthy lifestyle. Without the right beliefs about money, you will continue to repel it away from you, or you will fail to spot the money making opportunities, or the idea's and creativity will elude you, and even if you have an idea, your old negative conditioning will probably sabotage your efforts or prevent you from trying. The first step to creating a millionaire mindset is to clear your brain of all your old emotional baggage and junk regarding wealth and abundance, so you can replace all those fears and limiting beliefs with new positive and helpful ones. Most people are dogged by negative thoughts and beliefs, this is because their mind is forcing them to think the worst. For most people their brains have been programmed to focus on survival, they live their lives stuck in survival mode, going about their day feeling negative and stressed. The job of your brain is to take you away from pain and guide you towards pleasure, but to achieve the pleasure and success, your brain has to be focused on pleasure and enjoyment. To get your brain to focus on pleasure and success, it needs to be driven by calm and good feeling emotions. It is impossible to get your brain to bring you all the good things in life if your brain and body is stuck in survival mode. Once your brain becomes conditioned for survival only, that will become its number one priority, and when you attempt to change or do new things, then because your mind is set up for survival, it will try and oppose anything new or unknown to it. This is the reason why so many people struggle to change or make progress, which is, because their brain does not like change, any time you try to change or make your life better, your brain will see it as a potential threat, so it will use fear to try and keep things the way it is. When your brain is working against you, you will risk ending up living the exact life that you're living now. When you live your life in the emotion of fear and doubt, it will block you off from the road to success and abundance. This leads to endless negative thoughts and anxiety of fear of failure, fear of making mistakes and fear of screwing up. Life is all about momentum, you can have positive momentum or you can have negative momentum, positive momentum will take you to where you want to go and never momentum will take you to a horrible place of negativity, fear and stress. The key is to get the positive momentum going then keep it going, because all it takes is a few setbacks and you can soon find yourself spiralling backwards. Why it is so important to re-program your mind and change your old beliefs is, anybody can start to have a bit of success for a while. But when they hit a bad period as most successful people do, if you haven't cleared your old beliefs and conditioning, they will quickly rise back to the surface and sabotage and destroy all your success and effort. Positive Thinking + Skills/Mindset + Action, and this is what leads to great wealth. Steves formula to wealth states that, if you want to become wealthy, then you need to learn how to reprogram your mind to think like a millionaire. You have to get your mind working for you, this means shifting it from survival and scarcity mode to abundance and prosperity mode. When you have a scarcity and lack mindset, then this will create a negative emotional attachment to money and you will find it hard to come by. But when you make the shift to an abundant mindset, your energy will shift and new idea's and opportunities will come flooding to you. Of course you have to take action on these idea's they my take time to implement, wishful thinking alone is rarely enough, but unless you make the right positive mental shift, the chances are, the lifestyle that you want will remain elusive to you. Nearly all successful and wealthy people have to go on a journey, but you want to take the quickest and most enjoyable route possible. Your brain is capable of bringing you great success, happiness and wealth, it is also capable of bringing you a life of struggle and pain. Everybody has the same genetic makeup, when you come into this world your mind is a blank slate, who and what you become will depend on what you program your brain. If you want to be wealthy and successful, then you have to have the mindset and programming to match that life. Most people have the mindset of a poor person, you and your conditioning create your beliefs, then your beliefs will determine who you are and how you live your life. Your beliefs and your emotions are what creates your reality, the right software of the brain, will lead you to the life that you want to live. Everything that you do, starts off with a thought in your mind, your thoughts, beliefs and emotions will either make you or break you, your thoughts are the driving force behind your actions and behaviors. If you have the thoughts of a poor person or a person that has been conditioned to struggle or just get by, then you will not be able to spot or follow through with the right actions that are needed to create wealth or success. You might think, that is easy and all you have to do is just start thinking wealthy thoughts of abundance and the money will just flow to to you. However, for the majority of people, they have a big disadvantage which is, they grew up in a society that conditioned them to believe the opposite, and these negative beliefs that they inherited become deeply engrained in their subconscious mind. Steve says, that before you can have the right thoughts that will lead you to more wealth and prosperity, your brain needs to be programmed for wealth and success. The difference between rich people and the poorer people is all to do with what type of information their brains have been programmed with. If your brain isn't programmed to think like the rich do, then it will trap you in the poverty and lack mindset and reality. To be rich, you need the right conditioning and beliefs to drive your millionaire thinking thought processes, and unless you change these beliefs and paradigms on a subconscious level then your old negative conditioning will trip you up everytime. Because, it is your subconscious beliefs and programming that creates your reality, therefore your beliefs, mindset and thought processes have to be natural and in agreement with what you really want. Of course you may win the lottery or come into a lot of money, but because our beliefs and programming is so powerful, most of the people who win a lot of money, end up losing it, whilst others become too scared to spend it, because of their scarcity mindset or a poverty consciousness. The average person when they come into money usually does one of two things, they either go straight out and blow it all or they save it all for a rainy day. A poverty consciousness forces people into working long hours all their life, yet they live their life as if they are poor, because of the fear of running out of money one day, the sad thing about this mindset is, they cling on to all their money and take it with them to their grave. This is why you need an abundant mindset so you can have a steady and progressive source of income, so you can carry on living the lifestyle of your choice and you will have no fears about your money running out, so you can carry on spending and having the best experience possible. If you were lucky enough to be born into a family who are already wealthy and successful, then you will be half way there. Because the chances are, you would absorb the wealthy beliefs of your parents and the society conditioning, therefore you would naturally grow up to think that being wealthy and successful was natural. Society has programmed so many incorrect thoughts about how money works, that it takes a lot more than just positive thinking for you to become a magnet for it. However, Steves says, if you’re willing to change your way of thinking. If you’re willing to forget the well meaning advice from your friends, family, peers, and so forth. If you’re willing to implant the brain of a millionaire into your head, then you can start to change your life for the better. It can take years of dedication and effort to break and change your old patterns of thinking and idea's about creating wealth. For many this will prove too hard to achieve by willpower alone. Developing the millionaire mindset requires replacing a lifetime of your old learned limiting belief systems. Making the money is not the hardest part, changing your mindset is the biggest stumbling block. One of the worlds leading Hypnotherapists and self made multi millionaire Steve G Jones has created a program to fast track your mind to the millionaire way of thinking. Becoming a millionaire starts off in your mind and you cannot change your mind whilst you hold on to the old beliefs that are keeping you small. If you want to be rich and successful they Steve G Jones is your ideal mentor, has already achieved millionaire status, plus he is one of the worlds best hypnotherapists and a trained psychologist on wealth. Steve G Jones has created a six step formula that is designed to program your mind so you can go on to enjoy and live the best life experience that life has to offer. This program is a scientifically proven breakthrough that allows you to ‘deprogram’ the part of your brain that is holding you back from wealth, and replace it with the brain of a millionaire. After you have followed the six easy steps of this breakthrough method, you will have the thoughts, the drive, the ideas, the wealth mindset, and the eventually the millionaire lifestyle. The big advantage of the millionaire brain program is, It only takes just minutes a day to implement and the method has been specially designed for those people who have little time to spare, or those who don't want to spend hours trying to change. Think and act like a millionaire - 6 Steps works fast and there is no need for discipline or willpower and you can start to see results once you know how to think, act, visualize, manifest, and know everything. 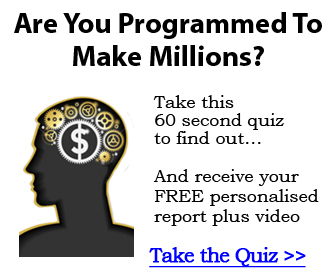 developed a cutting-edge 60 second quiz which reveals how closely your brain matches that of a millionaire. If you want to know if you have the brain of a millionaire. yourself on the millionaire fast track to wealth. you how to do that once you complete this quiz. Becoming a millionaire or just making more money requires a plan of action that you need to stick at and follow. Let's assume you're still at the wanting stage, so if you call the wanting stage point A then where you want to get will be point B. All you have to do is work out how to bridge the gap from A to B, this will require you to devise a plan of action and have a vision of your end outcome as if it is already achieved, try to imagine having the positive feeling that what you want has already happened. So you will need to project ahead up to your final destination as well as setting a course that you will need to follow and stick to. Many people can see the journey as daunting and beyond the capabilities, but all millionaires are just normal people like you and nearly all of them were once in the position you're in at the moment. The fear of failure may also hold some people back or put them off completely, but you must not let the fear of failure to hold you back. As the old saying goes " It is better to try and fail than it is to fail to try". This is why you need to make your journey as enjoyable as possible, although it is not a necessity, it will help you immensely if you do something that you enjoy or love, doing something you're already interested in and passionate about will give you a distinct advantage. First, you will probably already know a lot about your subject and secondly, you will feel more inspired and motivated because you're going to need all the motivation you can muster to help you overcome any obstacles and problems that come your way. It is far better to see any problems as a challenge that you need to overcome. Others will start of enthusiastic but because they did not do the groundwork, studying and mind work they never ever finish off what they started. Others will try and juggle too many balls in one go and instead of putting all their focus and energy into one project at a time they will start one thing then move on to the next big thing. These are just of a few of the pitfalls to watch out for, for those who carefully focus on their plan of action and they spend some time learning and studying from those who are already successful in the field they want to enter usually end up saving themselves a lot of wasted time. The more skills and knowledge you can obtain, the better your chances are of success in the long run so be prepared to listen and learn.